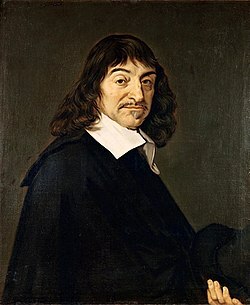 René Descartes (March 31, 1596 – February 11, 1650) was an important French philosopher, mathematician, scientist, and writer. Some people also call him Cartesius. English: Doubt is the origin of wisdom. What it means: When you have doubt you become wiser. English: I think, therefore I am. What it means: You exist because you think. English: Nothing comes out of nothing. What it means: If you do not do anything, nothing happens. This page was last edited on 7 December 2009, at 23:13.